Philadelphia Flyers coach Dave Hakstol got an eyeful of Jack Eichel during the Frozen Four. 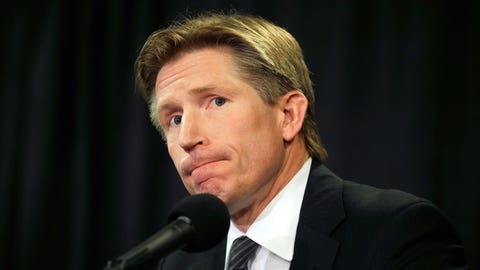 Philadelphia Flyers first-year coach Dave Hakstol has encountered numerous questions from reporters over the years, but one on Monday gave him reason to pause. "When you were at North Dakota, did you get a chance to see Jack Eichel?" a reporter asked, according to the Courier Post, ahead of Tuesday’s game pitting the Flyers against the rookie superstar and the visiting Buffalo Sabres. Well, Hakstol certainly did get a look at Eichel. A real good look, actually. Hakstol’s final game with the collegiate powerhouse came at the hands of 2015 Hobey Baker Award winner, who collected two goals and an assist in Boston University’s 5-3 victory over North Dakota in the Frozen Four semifinals. Eichel opened the scoring with a power-play goal early in the first period, assisted on A.J. Greer’s tally midway into the second and capped the festivities into an empty net with 19 seconds remaining. Hakstol did his best to answer the question by complimenting Eichel, who also went on to become the second overall pick of the 2015 draft. "He’s very dynamic with the puck. He’s one of those guys who with the puck he plays faster than he does without the puck," Hakstol told the Courier Post. "He’s got tremendous acceleration to his game, very good maturity to his game, for a young guy." Eichel has recorded a team-high three goals and a club-worst minus-7 rating this season with the Sabres. When #Flyers coach Dave Hakstol was at ND, Eichel had 2 G, 1 A in Boston U's 5-3 W in a Frozen Four semi last April. Flyers-Buff Tues.